Fiction Fixers Adventures in Wonderland free game is one of more than 400 free Games you can download at Free Ride Games, In Fiction Fixers - Adventures in Wonderland you start out as a young cadet, who's just joined the Fiction Fixers, a group dedicated to protecting classic literature. Sadly, last night The Illiterati - an infamous organization dedicated to the destruction of all fiction - broke into the Hall of Fiction and stole many valuable books! Their first target is Alice's Adventures in Wonderland and an evil agent has already transported himself into the book and started altering the storyline, which eventually may lead to the book being completely wiped out. As a Fiction Fixer, it's your duty to protect this work of art and restore what the Illiterati has damaged. 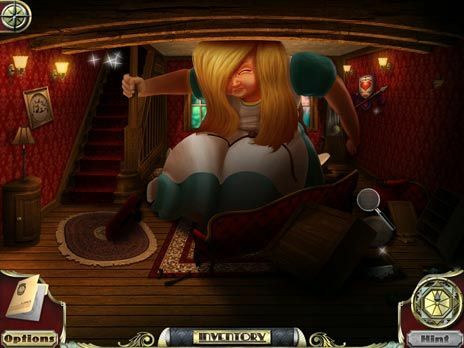 You start this Hidden Object game by following Alice down the rabbit hole enjoying the original storyline while keeping an eye out for changed facts or wickedly planted obstacles. When encountered, a Hidden Object game or mini-game follows to allow you to fix everything back to its origin. Download Fiction Fixers - Adventures in Wonderland for FREE and enjoy: * Hansel and Gretel bonus adventure. * Built-in Strategy guide. * 6 achievements to unlock. Free Ride Games is the only place where you can download over 300 top games for free, including Hidden Object games, Time Management games, Match Three games, Sports games, Puzzle games, Arcade games, Card games, Board games, Flash games, Fashion games, Food games, Online games, Word games and many more. We have hundreds of choices from the leading game publishers like iWin, PlayFirst, Sandlot Games, Mumbo Jumbo etc. Download Fiction Fixers Adventures in Wonderland free game and play it now.